At present, increased stress is put on ecological characteristics of forest ecosystems, such as biodiversity, healthy state of the forest and the sustained use of forest functions. Various natural conditions, such as terrain, soil conditions, territory accessibility and fragmentation of stands intended for logging, can arouse an interest in non-traditional transportation methods. In countries with developed economies, particularly in mountainous areas, ecology timber logging by helicopters is used more and more and it is becoming a current operational technology rather than an extraordinary measure (Messingerová, 1994). The results of this analysis are aimed at helicopter logging abroad, as well as our own experience in Slovakia, as research shows that interest in this transportation method is growing. The technology of helicopter logging has been used in many European states with developed forestry, such as Switzerland, Austria, Russia, Norway, Germany and France. In Canada and the USA the proportion of this technology in the total volume of timber yarding is even more significant. Authors' papers deal with technical parameters of various types of helicopters, performance characteristics and economic efficiency, as well as the impact of this technology on the environment. Stress is put on the selection of stands and preparation of the plan of terrain. A high professional level of helicopter pilots and other operators is an important precondition, as this technology is demanding on labour safety (Sperisen, 1990). The Swiss company, Helicopter AG Heliswies, has been dealing with timber yarding for more than ten years. To reach a performance of 20 flights per hour, a well-skilled team of forest workers and good work organization is necessary (Mayer, 1981). 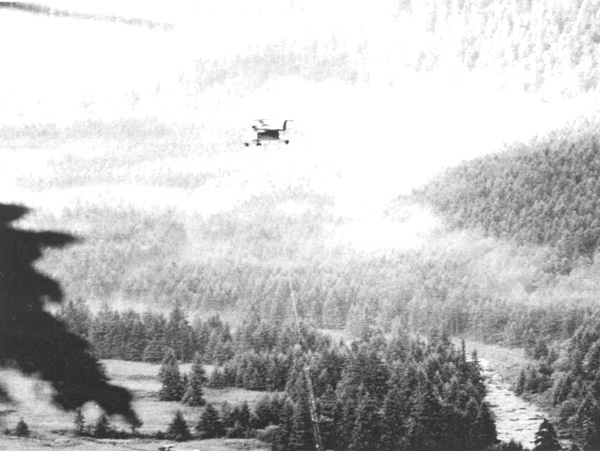 Koval and Solncev (1992) review the application of various logging methods in the forests of the northern Caucasus where helicopters are used for yarding. They compare the damage to the environment of various timber yarding technologies. In the USA and Canada helicopter technology with helicopter carrying capacity of 2.5–10 tonne is used. Timber is yarded to a distance of about 1 500 m with 120 to 150 turns (cycles) per one shift. Mean performance per shift is 200 to 470 m3 of timber. In the forests of Slovakia a MI-8 helicopter with carrying capacity 3 tonne (see Photo 1) is used for timber yarding. Working procedures and technical equipment are derived from experience with load transportation in industry, and the work is performed by specialized private companies. Mean performance per one day ranges from 200 to 250 m3, mean time consumption per 1 m3 of timber is about 10 percent of the time necessary for other technologies of timber yarding. The research on this technology was carried out in several localities in the period 1992–1999. Time measurements of particular working operations and performance per shift were processed. Economic analysis was made with the aim of assessing performance. Measurement methodology was based on traditional methods of work assessment. Simultaneously external noise was measured in the workplace, as well as in the surroundings, namely in a hectare network to the distance of 2 km. The measurements were processed into noise maps. The results from the locality in the High Tatras (Správa TANAP, LS Javorina) conducted in June 1999 are presented in this paper. A model of noise transmission in a particular locality was derived from measured values. fulfilment of technical requirements for helicopter operation. The technological procedure should be adapted to terrain conditions, particularly to the kind of logging. Whole trees, whole stems or assortments can be yarded by helicopter. The work in the stand, namely delimbing and separating of stem from root collar, providing the timber from salvage felling, is carried out. Salvage felling proceeds from the lower part of the slope and preparatory work must be performed prior to timber yarding. If the volume of stems is not high, bucking of stems must be performed in a place with suitable conditions for safe tying of stems and helicopter flight. If the timber logged is dispersed in the stand, the helicopter can easily lift the stems also from specific places. The technological procedure in the stand in helicopter yarding of trees (intentional regeneration felling) can influence significantly the efficiency and safety of this technology. By securing directional felling the optimal weight of load for the helicopter can be obtained according to carrying capacity. Simultaneously a hazard to labour safety can be minimized. In comparison with processing timber from salvage felling, in most cases other yarding and skidding equipment is not necessary. Larger stems must be shortened to comply with the permitted load of the helicopter. The length of logs depends on species, the volume weight of the tree species, timber moisture and kind of assortment. The performance of helicopter technology in timber yarding is influenced significantly by the quality and readiness of preparatory work in the stand. Preparing for helicopter yarding already during logging can influence the time consumption necessary for tying of the load and thus also the duration of the whole working cycle. The proportion of time consumption for respective operations of the working cycle is given in Figures 1 and 2 and Table 1. The crew of the helicopter consists of three operators (two pilots and one navigator), the load is prepared, tied and untied in the log yard (providing the load is not untied automatically) by other operators specially skilled for the work of load hanging below the helicopter. Timber should be yarded outside residential and industrial areas so as not to endanger people, buildings or any equipment in case the load unties accidentally. The workplace must be protected against the presence of unauthorized people. Timber yarding by helicopter must comply with valid rules for aerial transportation, and it cannot be performed in fog and strong wind. The slope and configuration of terrain, as well as rain, do not interfere with helicopter operation but do make the work of the operators on the ground more difficult. The performance of the helicopter depends on time of turn, size of load per one cycle and forced idle time. The duration of the working cycle depends on the performance of the workers who tie the load, on their ability to determine its weight and to tie stems quickly, and to prevent repeated untying in case of overload. Each helicopter is equipped with a device for measuring the weight of the load by dynamometer. This equipment saves checking the proper weight of the load. Load untying can be done manually, mechanically or automatically. The size of the load depends especially on the carrying capacity of the helicopter, season and length of daytime for dependence on temperature conditions. With lower temperatures lifting capacity is higher. It is more advantages if the load consists of a smaller number of stems because a shorter time is necessary for tying. At the same time tying or accidental untying of the load is safer. The load is tied to the helicopter either by the winch rope or, more frequently, to the fixed rope of the helicopter because lifting of the load by winch is slower than by the fixed rope. Moreover the winch decreases the useful weight of the helicopter. Fixed rope is 30 to 50 m long. It is possible to perform timber yarding anywhere. It is better if the timber is stacked in an open area, for example on the border of the stand, but the load in the stand can also be lifted by helicopter moving above the stand. From the technological viewpoint the most demanding operation is the tying of the load in the stand. This operation must be performed as quickly and safely as possible. Particularly during the processing of the timber from salvage felling the conditions for tying are demanding and difficult. Therefore, it is more advantageous if at least two workplaces are prepared on the particular plot (with two operators tying the load in each workplace). It creates a time reserve for the preparation of following loads. The co-ordination of the whole team goes on with the help of transmitters. The forest workers must wear ear protectors and safety helmets. In tying the load into chokers, the forest workers must move away quickly to a safe distance in case the load unties accidentally and because the velocity of air circulation below the helicopter is 220 km per hour. The selection of sufficient log yards and their localization plays an important role in the technological preparation of the workplace. The location of the log yard must enable the putting down of the load without any time or spatial restriction. The size of the log yard depends on the amount of timber and the requirements on timber sorting, for example by tree species or assortments. Though time consumption per working cycle is low with the distance of yarding 700–800 m, it enables partial skidding up of stems by tractors in the yard. From the viewpoint of technical safety, it is necessary to choose a safe place for the fuel tank to serve as the place for fuelling. The advantages of helicopter logging in eliminating damage to the forest environment are indisputable. The forest soil is not disturbed and conditions for precipitation erosion are not created. However, helicopter noise negatively affects the environment. Noise measurements were carried out by means of Bruel and Kjaer equipment with weight filter A. Noise was measured on the ground in the workplace and in the surroundings according to the procedure specified by respective hygienic standards. The noise of the helicopter was assessed as an effect on workers (noise in the workplace) and on others (noise outside the workplace). In the first case the highest permitted level of noise is Lp = 80 dB (A) with the correction of basic level - 5 dB because we can consider the work of workers tying the load strenuous and demanding on their accuracy and concentration. In the second case we can use the value 55 dB (A) as the highest permitted level of noise for aerial operations (Konrád and Messingerová, 1993). If the helicopter is hanging over the working place (the length of rope is 50 m) and the noise in that place is 93–100 dB (A). The permitted level of 80 dB (A) was found in the distance 100–250 m according to the terrain configuration. The distribution of noise in greatly broken terrain with noise shadows (over the ridge, in dense stands) shows a different distribution than in open areas. Therefore, in this area the workers must wear ear protectors. The value of noise in the surroundings of slightly broken terrain shows that the values of permitted level of noise were found in the distance 1.0–1.5 km. The last measurements of noise were conducted in the High Tatras in June 1999. The noise level model was derived from the results depending on the distance and height of the helicopter (see Figure 3). The technology with helicopters reaches a performance 8–10 times higher than tractor technology, and 20 times higher than cableways. It follows that noise during work with a helicopter attacks the forest environment for a substantially shorter period. This fact is particularly important in protected areas. It should also be borne in mind that noise was measured under the most unfavourable conditions. During the flight of the helicopter, the level of noise on the ground is substantially lower. Analysis of time consumption for respective operations was carried out. Periods of the impact of direct noise on the workers on the ground were processed. Noisy and silent intervals were calculated for the workers operating on the ground. The results presented in Table 3 show that only during a short part of the working cycle are the workers tying and untying the load subjected to excessive noise. Forest workers tying the load are subjected to the injurious effect of noise for about 97 min per one shift, and forest workers untying the load for about 43 min. Another issue is the effect of excessive noise from the viewpoint of disturbing the fauna, especially in protected areas. In the selection of the time period it is necessary to take into consideration the bird nesting and game mating seasons and to agree the terms of helicopter yarding with the organs of State administration of nature protection. According to the analysis of timber yarding abroad and our own experience, helicopter technology is a high performance and environmentally friendly technology. It is advantageous because roads need not be constructed, timber is skidded without damage to forest stands, timber yarding can be performed in the stands with difficult access, or without any access at all where traditional ways of logging cannot be used and where, therefore, the production potential of such stands has been decreasing. Helicopter technology ensures elimination of soil erosion, quick yarding of large volumes of timber in processing timber from salvage felling, and timber utilization without any quality reduction. Providing planning and work organization is good, as well as considering safety and noise impact on the environment it is possible to obtain good results in spite of the fact that in comparison with traditional technologies helicopter logging is the most risky. Despite the high cost of helicopter technology, it can be supposed that this technology is very promising in stands where requirements on the preservation of environmental stability are dominant. Konrád, V. 1973. Vplyv hluku a vibrácii na pracujúcich pri sústredovani dreva traktormi. Referát ku skúške z ašpirantského minima, 1973, Zvolen, 71 pp. Konrád, V. & Messingerová, V. 1993. Rozbor technológie, spotreby casu a hluku pri približovani dreva vrtulníkom. AFF, 1993, TU Zvolen, p. 321–333. Koval, I.P. & Solncev, G.K. 1992. Rubky v lesach severnogo Kavkaza. Lesnoe Khozjaistvo. 1992, No 1:13– 14. Messingerová, V. 1994. Sústredovanie dreva vrtulníkom. Vedecko-pedagogická aktualita c. 6, 1994, 50 pp.